Despite recent advancements in information and communication technologies and growing sales numbers, industry has been rather reluctant to standardise access technologies and to implement them in a Design for All approach. Most often, the design and the implementation of appliances, mobile phones and remote controls are driven by the ambition to satisfy users that are already engaged in modern technologies. Thus many people with disabilities, in particular persons with cognitive disabilities and older persons, are excluded from using modern technologies, at home and in the public. This also means that they are – and will be increasingly more – severely impeded in participating in our society, in living an independent life and in realizing their full potential. I2HOME will address this problem with an approach based on existing and evolving industry standards. We will focus on the use of home appliances (including consumer electronics) by persons with cognitive disabilities and older persons. At the same time we will take care that the developed and standardized access strategies will be applicable to domains beyond the home. Fig. 1: I2HOME wants to help you controlling devices at home. In I2HOME, we will build upon a new series of industry standards (ANSI/INCITS 389ff) for interfacing networked appliances by means of a Universal Remote Console (URC). 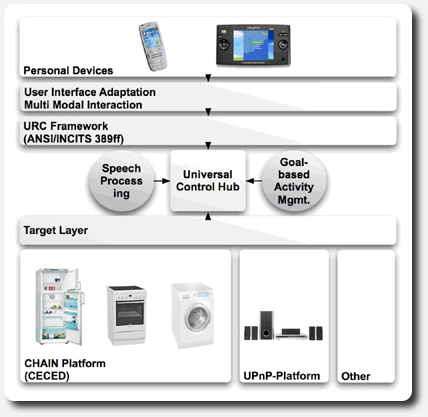 We will use an architecture that incorporates a Universal Control Hub (UCH) as core component which provides and manages the communication to networked (off-the-shelf) home appliances and consumer electronics devices through industry networking protocols. The UCH will provide intelligent and adaptable interfaces that are particularly targeted to persons with cognitive disabilities and older persons. The user interfaces will be designed according to the results of a broad requirements analysis and will include multimodal communication and activity management. In an incremental process, we will conduct large evaluations of the project intermediate results in controlled laboratory environments as well as in day-care centres, in four different countries. Thus the experiences and results from the evaluations will be fed back into the development cycle multiple times to further improve the usefulness of the developed technologies for our target users. Fig. 2: Concept of URC stack.